It's taken me an unconscionably long time, but section 02, The King of the Great Clock Tower, is ready for PL. Ian, if you read this, I've left out lots of your stage directions. They were beautifully done, but I think (I hope!) this preserves both the listening flow and some of the unnerving and symbolic elements that this would have had when staged. We have a PL for my editing! I'm posting that exciting news so that nobody else comes along and doubles the work unnecessarily. The editing on Sections 1 & 2 is PL OK. Both really top class recordings! I just noticed one thing on Section 1, but you may have done it intentionally. On p. 20, the text has 'The attendants close inner curtain singing', while the recording does not have the 'singing' (12:45). Is this intentional because the attendants are not, in fact, singing? Woo hoo, thank you Phil! You're quite right, that was partly because the attendants weren't singing and partly to trim references to stage directions not directly related to visual stuff impossible to represent in an mp3. I've marked them both PL OK, and I'll get to work on the summary! Very well done everyone, and thank you for taking part! 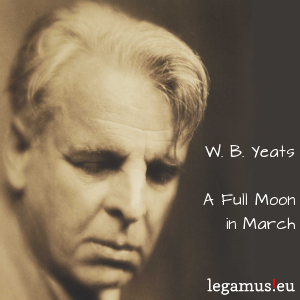 William Butler Yeats first published this collection in 1935. In it, he developed themes and symbolism prevalent throughout his work, including his fascination with masks and Irish legends. Do we have an online text, or a cover yet? If, and only if, there is room for a third PL, would it be possible to add Phil's name? He checked my editing of the dramas. If not, not to worry, as having two credits for PLing is still a decided improvement over LV! There isn't (yet) an online text. I definitely don't have a cover! And you really don't want me to provide one, either. Would it be worth asking one of the regular artists on LV? There can be as many PLs on the catalog page as have been involved in the project! I added Phil. For the cover, here's a deal: if you find me a fitting picture - for example some old painting that has a Wikipedia photo - then I choose a font and write the text on it. Fantastic, thanks! I realise it isn't always possible to give everybody credit, but it's nice when that does happen. 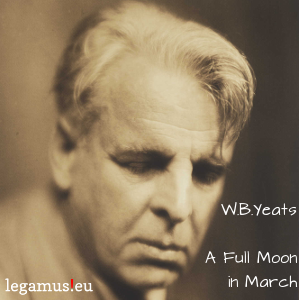 What do you think to this photo of Yeats from roughly the same time he was writing this book? (The photographer died in 1942, so the copyright ought to be okay.) If it would be tricky to work with, I'll keep looking! Will try to make a cover until Sunday night! No rush! I appreciate your efforts, because we'd be here all year if it were down to me to come up with a cover. you can see my humble effort on the catalog preview page linked above. I'm not too happy with it. A cover must be 300x300 pixels (square), so the head cannot get "smaller" on the cover as it is now (or it would be cropped). And if I don't want to write the text over his head, it looks as crammed as it does now. EDIT: I managed to "create" some space to the right, so it looks less crammed. I like it! When I saw your message I wasn't sure what to expect, but I think you're being hard on yourself. It looks really good - thank you very much for creating it! Thanks! Then we're good to go! Thank you so much, Viktor! It's exciting to have this one out there and waiting to be listened to!